update: thanks to Svetebella, I now have a key to the persons in the photograph. 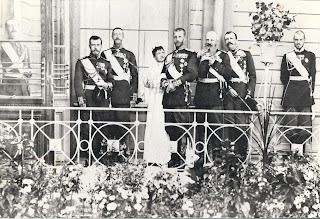 Grand Duke Paul Alexandrovitch (seen behind the window), Nicholas II, Grand Duke Konstantin Konstantinovitch, Duchess Eugenie of Oldenburg, GD Sergei Alexandrovitch, Grand Duke Michael Nikolayevitch, Grand Duke George Mikhailovitch, Grand Duke Sergei Mikhailovitch, taken sometime in 1897 or 1898. Duchess Eugenie of Oldenburg was born Princess Eugenie Leuchtenberg, second daughter of Grand Duchess Maria Nicolaevna of Russia and Maximilian Beauharnais, 3rd Duke of Leuchtenberg. In 1868, she married Duke Alexander of Oldenburg, a grandson of Grand Duchess Catherine Pavlovna of Russia. They were the parents of one son, Duke Peter Alexandrovich, who married Nicholas II's youngest sister, Grand Duchess Olga Alexandrovna. Duchess Eugenie was a very close friend of Empress Maria Feodorovna of Russia. 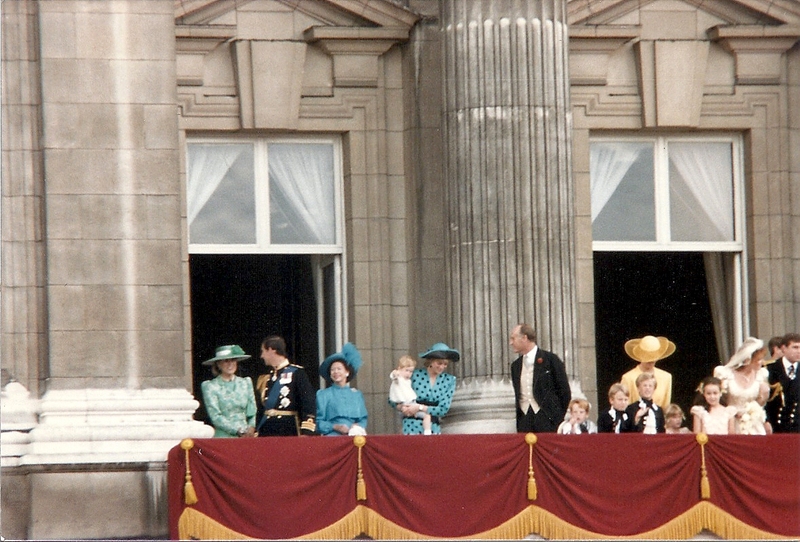 Grand Duke Pavel Alexandrovitch (seen behind the window), Nicholas II, GD Konstantin Konstantinovitch, Duchess Eugenie of Oldenburg, GD Sergei Alexandrovitch, GD Mikhail Nikolayevitch, GD Georgiy Mikhailovitch, GD Sergei Mikhailovitch. 1897-1898 years. Though don't remember exactly Peterhof or Tzarskoe Selo. 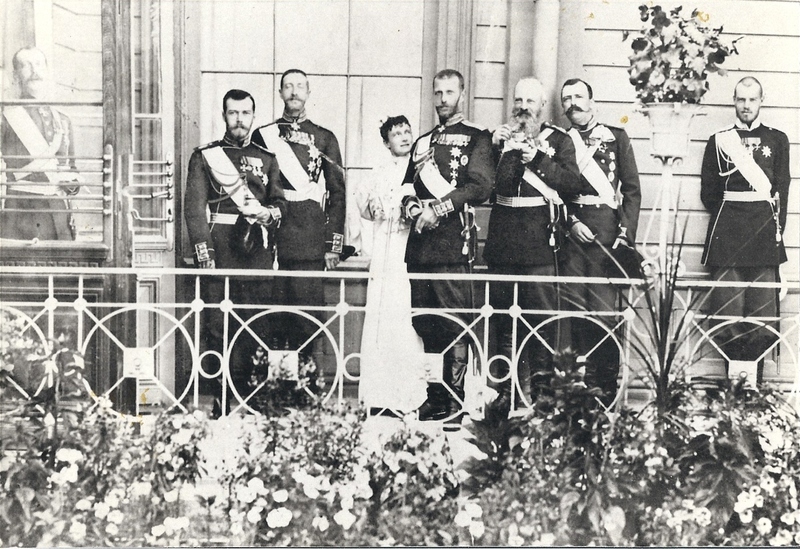 After Nicholas II is Grand Duke Konstantin Konstantinovich, Grand Duchess Maria Pavlovna, the wife of Grand Duke Vladimir Alexandrovich, Grand Duke Sergei Alexandrovich, Grand Duke Mikhail Nikolaevich, Grand Duke George Mikhailovich and Grand Duke Sergei Mikhailovich. После императора Николая II стоит великий князь Константин Константинович, великая княгиня Мария Павловна, супруга великого князя Владимира Александровича, великий князь Сергей Александрович, великий князь Михаил Николаевич, великий князь Георгий Михайлович и великий князь Сергей Михайлович.